"Utilizing an existing piece of furniture in your home is a great way to save money in a living room. Before investing in something new, check for functional or statement pieces you have around the house that can be rearranged, refinished or repurposed to bring new life to your space and relief to your budget. Reupholstering our Newport Heights clients' demilune sofa with a rich navy velvet completely transformed the outdated piece into the luxurious focal point of the room without breaking the bank," says designer Wendy Blackband. 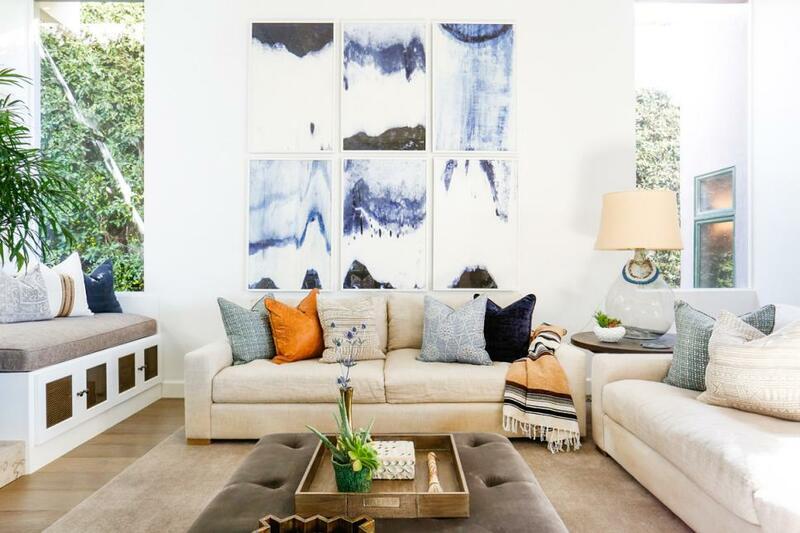 "In this San Clemente living room, we splurged on an art gallery wall, and it made such a huge difference. This space had tall ceilings, so the art helped bridge the gap between the height of the ceiling and the furnishings. It makes a bold and interesting statement as soon as you walk into the room," says designer Wendy Blackband. "Designing a living room can be stressful because it's generally a larger space where we spend a great deal of time. Between the furnishings, art, drapery and lighting, costs can add up quickly, and I've found that a safe place to save is through the selection of budget-friendly natural fiber rugs. Offered in a variety of colors and weaves, they serve up a durable, textural backdrop that suits every design style. I love that you can allow a natural fiber rug to lie solo or you can layer smaller hides and luxury rugs on top," says designer Marie Flanigan.